With the new BMW R 1200 R and R 1200 R Classic, BMW Motorrad is continuing its long tradition of roadster building and presents the revised successor models to the successful R 1200 R. Both combine a modern sporty and accentuated classical motorcycle design, once again with considerably greater quality and driving dynamics for even more riding fun. Generating perceptibly higher torques, the new boxer engine provides an extra boost to temperament. Whereas the boxer in the predecessor model had already provided superior propulsion under all conditions, the new BMW R 1200 R models can deliver more on top. Derived from the BMW HP2 Sport, their new boxer with 1170 cc and DOHC valve gear corresponds to the engines already installed in the BMW R 1200 GS and BMW R 1200 RT. Thanks to ultra modern technology in conjunction with two different design concepts, the new BMW roadsters are setting discrete emphasises in the segment to a degree greater than before. Whereas the basic version of the BMW R 1200 R emphasises the sporty all round character with new cast light alloy wheels, the R 1200 R Classic presents wire spoke wheels for a deliberate touch of refined nostalgia. This demarcation between the two new roadster models is also continued in the colour of the paintwork and other equipment details. 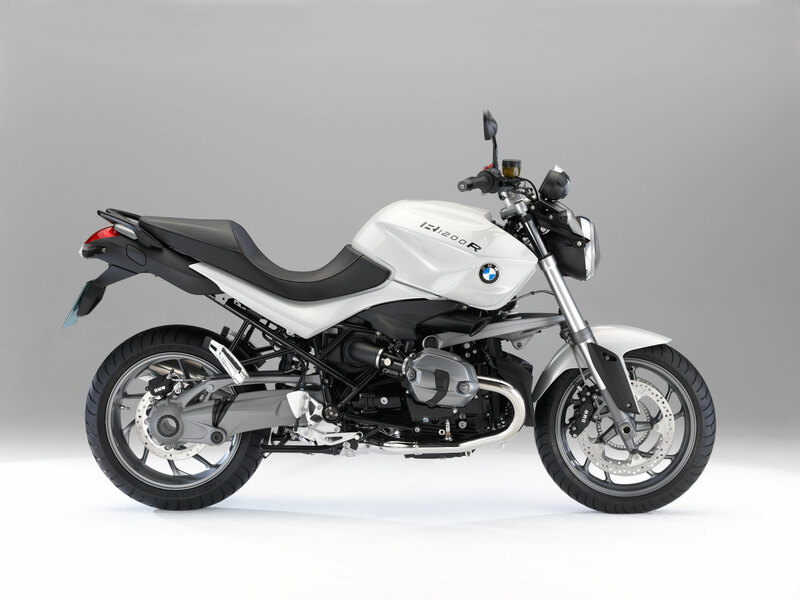 For instance, the R 1200 R Classic pays homage to the classic roadsters with metallic sapphire black paintwork in conjunction with a centre stripe in plain alpine white extending over the tank and front wheel cover. The basic version of the R 1200 R is available in mat metallic smoky grey, metallic light grey, or metallic red apple: three colour schemes representing a dynamic, elegant, and modern interpretation of the roadster. These three colour variants when combined with wheels and drivetrain in Nürburg silver highlight the sporty, dynamic side of the roadster. The R 1200 R Classic, on the other hand, deliberately goes for a refined contrast and emphasises components like the Telelever, drivetrain, cylinder head covers, frame, and fork with silver. Their classical, refined quality also finds expression in the completely chromium-plated exhaust system and the mirrors with a chromium look, whereas the basic version provides a sporty touch in the form of a rear silencer in brushed stainless steel and black rearview mirrors. Despite the differences in visual appeal presented by the R 1200 R and R 1200 R Classic, they are nevertheless united in their technology. For instance, maximised rigidity and strength is provided by the tried and tested, two part main/rear frame, which has a weight-saving structure of steel tubing is designed with the engine as a load-bearing element for maximum stiffness and rigidity. 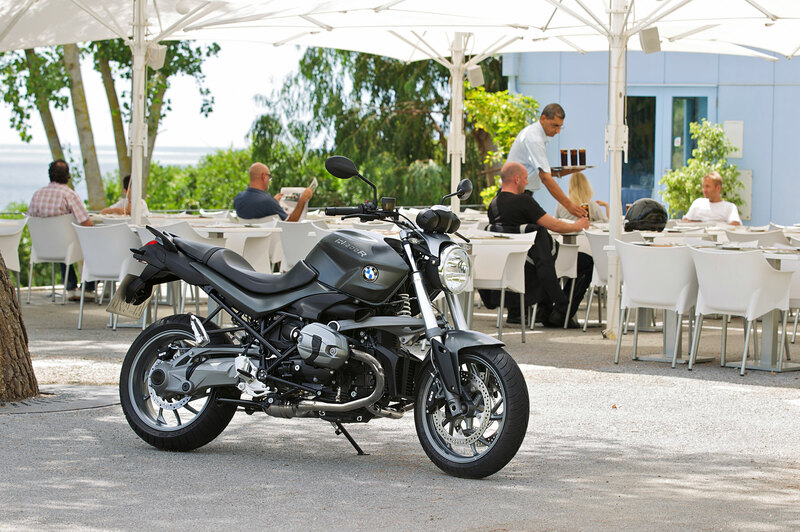 The front suspension of the new BMW R 1200 R trusts in the BMW Telelever in conjunction with a new fork structure. Its high quality, technical grace and the enlarged diameter of the standpipe (from 35 to 41 mm) contribute decisively to shaping the face of the new R 1200 R. The rear suspension takes the form of the tried and tested single arm with BMW Paralever. Both the R 1200 R and the R 1200 R Classic can be fitted optionally with electronic suspension adjustment ESA. This serves to vary the spring base and the suspension’s pressure and rebound stages at the rear wheel, and the suspension’s rebound stage at the front wheel – a system that has established itself as the solution for optimised road handling and comfort. The maximum safety standard is ensured by the established and proven brake system, which can be fitted in the factory with the optional BMW Motorrad integral ABS (in the partially integral version) and automatic stability control ASC. In its role as a traditional system provider, BMW Motorrad has also developed for the new R 1200 R and R 1200 R Classic extensive ranges of optional equipment and tailored optional accessories for further individualisation. 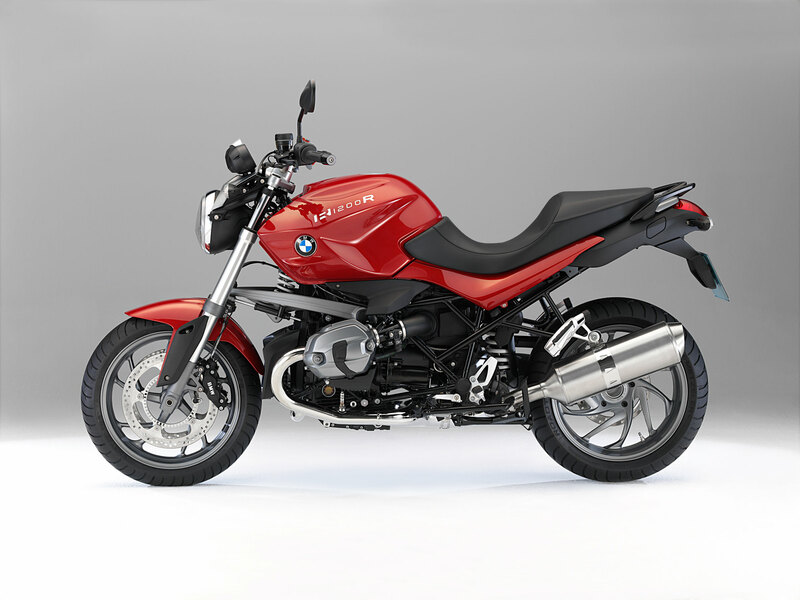 Find the accessory for your BMW R1200R from Motorcycle Accessory Hornig here in the online Shop. * Clear differentiation between the R 1200 R and R 1200 R Classic in the form of characteristic colour concepts and equipment features. * New dynamic drive, now with double overhead camshafts in each cylinder. * Maximum torque raised to 119 Nm at 6000 rpm, and rated power raised to 81 kW (110 hp) at 7750 rpm. * Maximum engine speed now raised from 8000 to 8500 rpm for an even wider utilisable speed range. * Perceptible improvements to torque values for even greater roadster pleasure on country roads. * Spontaneous response with optimised controllability and clearly improved load-alteration effects. * Cylinder-head covers now with two instead of the previous four mounting bolts and a new, dynamic styling. * Shorter, sportier rear silencer in brushed (R 1200 R) or chromium-plated (R 1200 R Classic) stainless steel. * Electronically controlled exhaust flap for a superior powerful sound. * Cast light alloy wheels (R 1200 R). * Wire spoke wheels with light alloy flat collar rims (R 1200 R Classic). * ESA (electronic suspension adjustment) (optional factory fit). 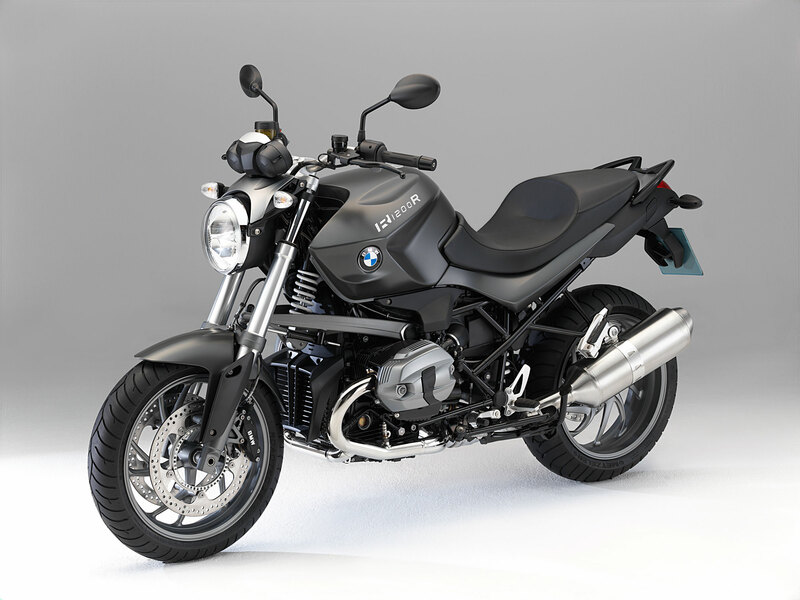 * BMW Motorrad integral ABS in the partially integral version (optional factory fit). * Automatic stability control ASC (optional factory fit). * Redesigned cockpit with two round analogue instruments. * New hydraulic reservoirs with a smoked glass look.